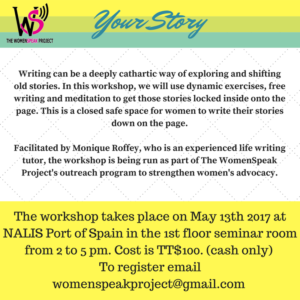 On Saturday May 13th, 2017, The WomenSpeak Project concluded it’s Your Story Writing Workshop for Women. The workshop was once again led by our excellent facilitator Monique Roffey who took participants through exercises to help them ‘mine their memories’ and give voice to the anger, frustrations and fears that were buried for many days, months, years or decades. Women were reminded that advocacy is something each of us can do everyday, right where we are. We can stand up for women in our workplaces when they are being treated unfairly; we can stand up for ourselves and not be boxed-in by notions of what we ‘should’ be; and we can write about our experiences so that others can relate to and learn from what we have been through. Monique discussed the difference between art and therapy and reminded participants that while writing can help us make sense of the things that have happened to us, it was not until we shaped our ‘raw’ thoughts into more coherent and focused writing that we are able to respond to issues in a more direct and reasoned manner. We are pleased that there are now 33 new members of the WomenSpeak community whom we have welcomed through these workshops and look forward to providing more opportunities for women throughout the Caribbean to become advocates.